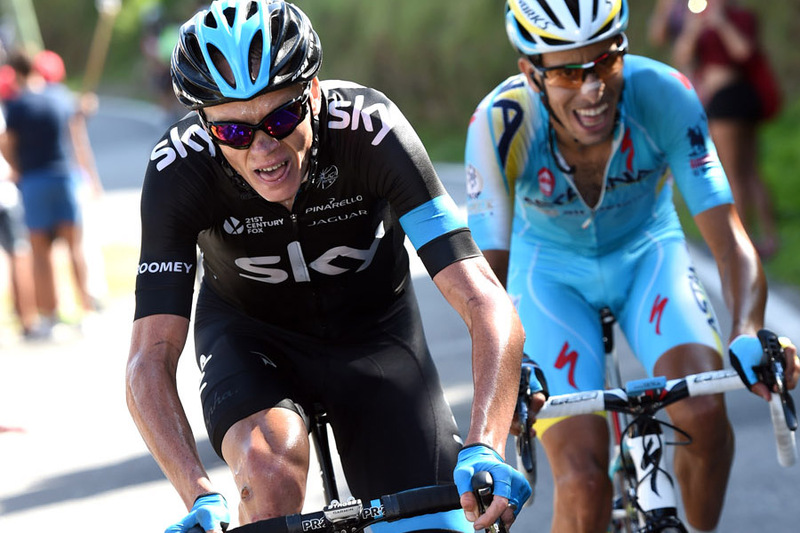 Chris Froome moved from third to second overall after stage 18 of the Vuelta a Espana today, won by Fabio Aru. Froome (Sky) finished runner-up to Aru (Astana) on the featured uphill finish with Alejandro Valverde (Movistar) rounding out the podium. The Sky leader collected time bonuses during and at the end of the stage to lessen the gap to race leader Alberto Contador (Tinkoff-Saxo), who he now trails by one minute and 19 seconds. The peloton was reluctant to let any moves go at the beginning of the race that featured two ascents of the category two Monte Castrove in the final 30km of what was a circuit finish. Eventually Luis Leon Sanchez (Caja Rural – Seguros RGA), Johan Le Bon (FDJ.jr) and Hubert Dupont (AG2R La Mondiale) escaped but were inevitably caught with a stage win available for the general classification contenders. Sanchez was the last to be caught, with Sky doing the majority of the chase work on the front of the main group, with some 15km remaining. The main stage and race contenders stayed together in the front group toward the business end of the race. Aru, who started the day fifth overall, moved across to Jerome Coppel (Cofidis) within the last 4km and, unlike the latter, never looked back. 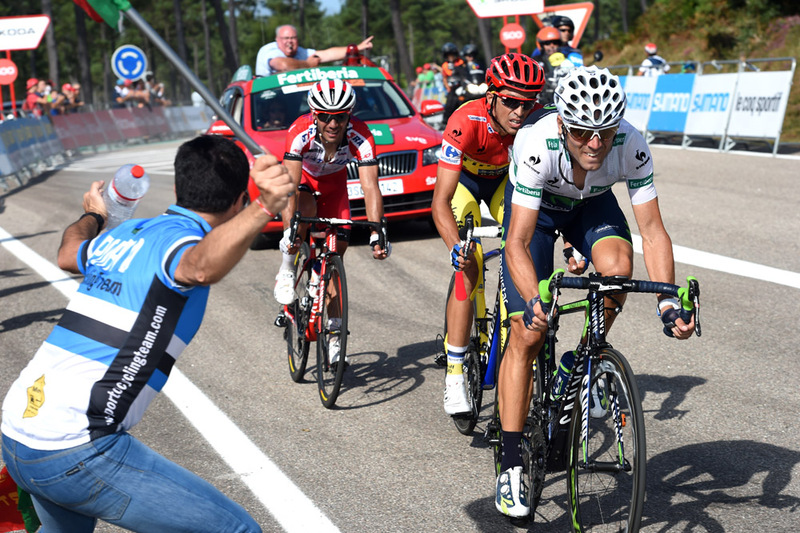 Coppel dropped as Contador’s Tinkoff-Saxo took to the front with Aru holding a slender 11 second advantage. Froome made his key move inside the last 2km leaving Contador, Valverde, plus others, in his wake to bridge to Aru. However, the 2013 Tour de France champion could not match Aru in the sprint to the finish line and had to settle for second in a day that he can be pleased with, with Sky again demonstrating its trademark control throughout. Meanwhile, Fabian Cancellara (Trek), Tom Boonen (Omega Pharma – Quick Step), Robert Gesink (Belkin), Koen de Kort (Giant-Shimano) and Cameron Meyer (Orica-GreenEdge) were among several riders that did not start the 18th stage. Cancellara, Boonen and Meyer all cited preparation for the upcoming UCI Road World Championships. Gesink had a private family matter to see to and de Kort withdrew due to illness.